Oven Baked BBQ Chicken, baby! 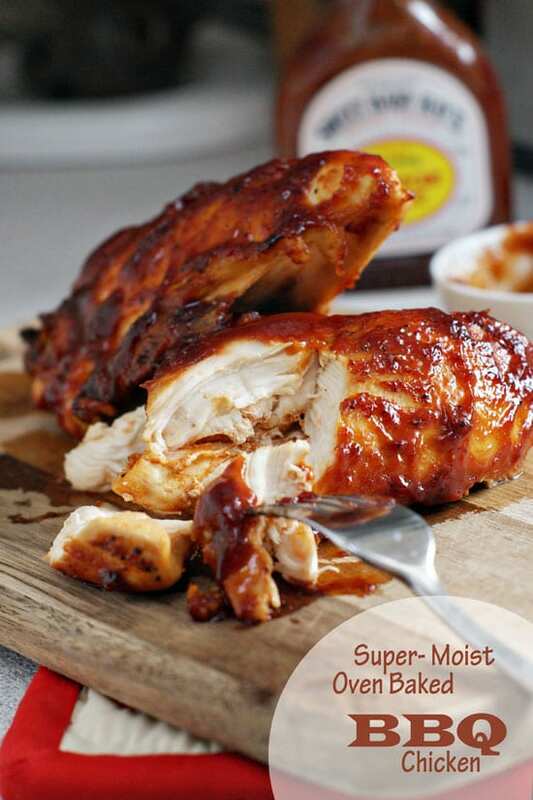 Today we’re talking about baking chicken breasts to moist, juicy perfection, smothering them with BBQ Sauce and consuming immediately! Are you ready for this deliciousness? 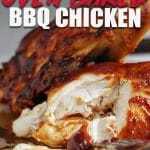 Today’s recipe for oven baked bbq chicken is moist and juicy. And while we’re focusing on smothering it with BBQ sauce, this preparation can be used on just about any flavor chicken you can dream up. Just marinade, season, bake and enjoy. A well-baked chicken breast is, in my opinion, hard to find. Even at the best restaurants, it seems like chicken is kind of the implanted “safe food” on the menu for the unadventurous and takes a back seat when it comes to quality preparation. 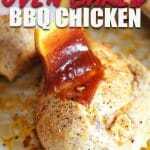 What kind of chicken should I use for the best oven baked BBQ chicken? The key is to start with bone-in, half chicken breasts. Boneless and skinless chicken has its place in the poultry kingdom, but not here. We want the bone because it keeps the meat from drying out and imparts excellent flavor. Since we’re smothering this chicken with BBQ sauce, I’m going to take the skin off, but I often leave it on if I’m cooking it without a sauce. Leaving it on will naturally baste the chicken as it cooks and also crisps up nicely if you like that sort of thing. I’m kind of a skin hater so even if I leave it on to cook I rarely eat it. Marinading is all about adding flavor and moisture to the meat. 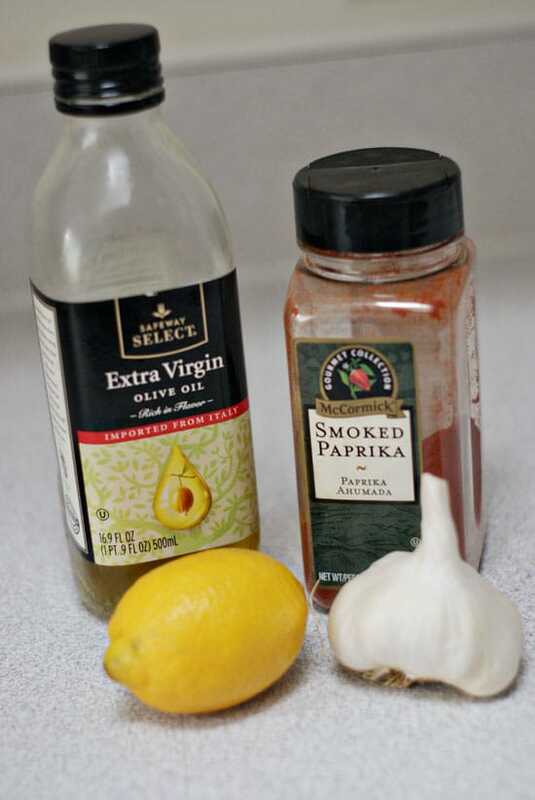 I’m using a combo of olive oil, lemon juice, smoked paprika (for that smoky BBQ flavor) and minced garlic. If you don’t have smoked paprika, I definitely suggest you get some! It has such good flavor and gives a nice smoky flavor to anything you add it to. 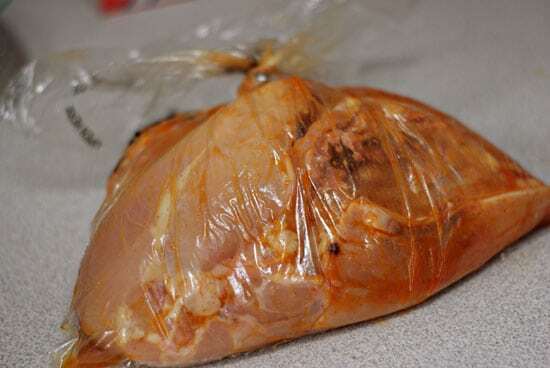 Mix up the marinade and pour over the chicken in a ziplock bag. I clearly ran out of bags, so I had to improvise and use a produce bag. It worked in a cinch, but I won’t recommend you try it. Bones + thin plastic + ewwie chicken juice = a mess in my fridge. Just use a regular bag, please. I use a bag as opposed to a bowl because you don’t have to use very much marinade to cover the chicken and it seems to marinade more evenly. 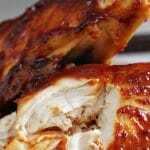 How long should I marinade my oven baked BBQ chicken? Place the chicken in the fridge for at least an hour or up to overnight. Going much past 24 hours could result in some funny-textured chicken though. Take the chicken out of the marinade and place on a baking sheet. Season with liberally with kosher salt and pepper and pop in a 350-degree oven for 20 minutes. 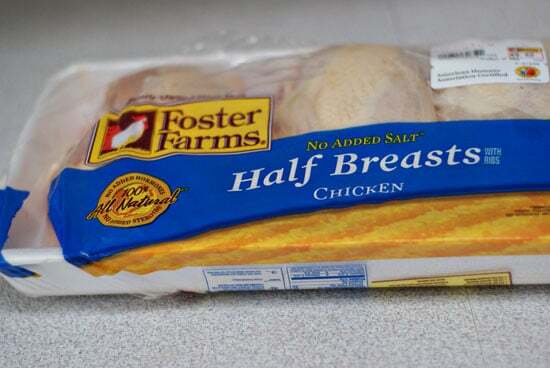 After 20 minutes your chicken will be about half-way done depending on the size of the breast. 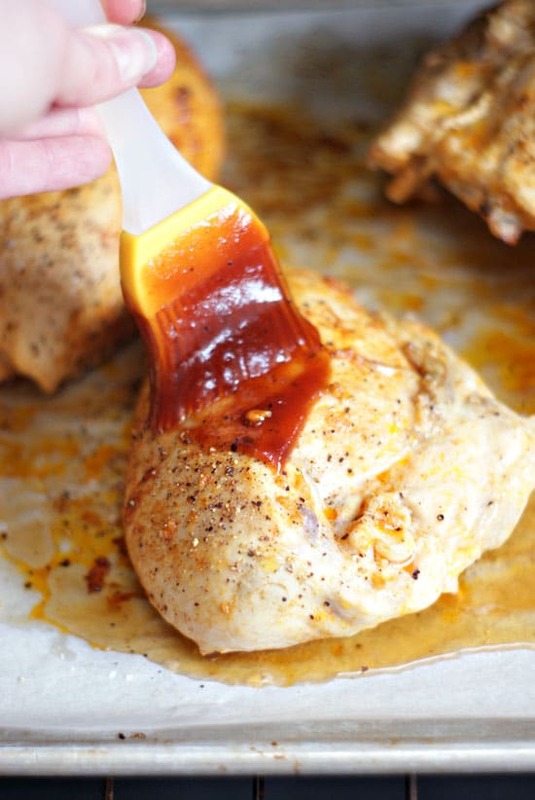 Brush each breast with your favorite BBQ sauce and return to the oven. Repeat the application of BBQ sauce to the chicken every 5 minutes until the chicken is cooked through. 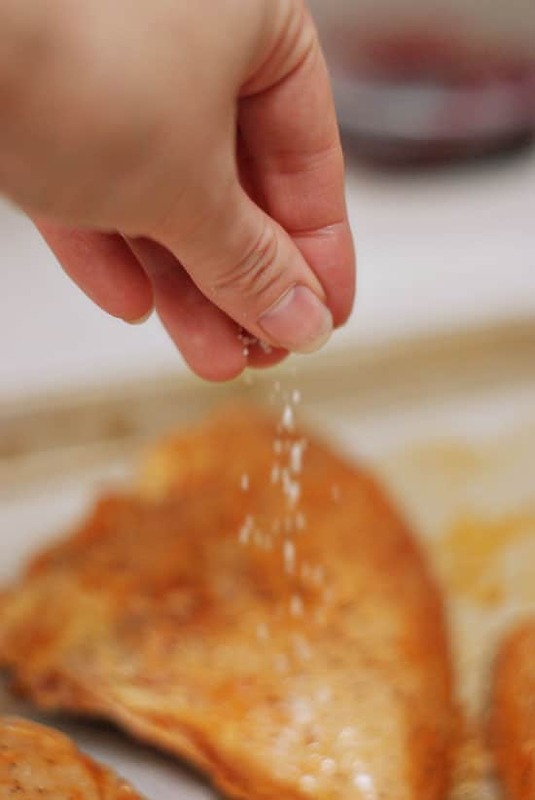 Standard chicken breasts take a total of 35-40 minutes, so 4-5 brushings with the sauce should do ya. 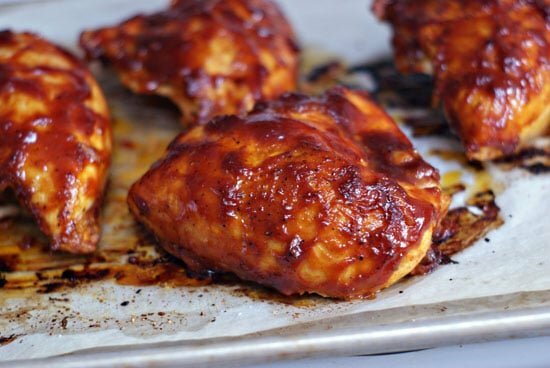 If you have a thermometer, insert it into the thickest part of the breast and remove from the oven when it hits 165 degrees F.
How do I get that sticky-sweet caramelized sauce on my BBQ Chicken? Taking the time to apply the sauce to the chicken at 5-minute intervals results in a deliciously sticky, glazed exterior that makes me want to lick my fingers just thinking about it. Where to get the BEST chicken? If you’re looking for great place to get your chicken from, we LOVE using Butcher Box. I get a box every month, and their meats are seriously amazing. They deliver healthy 100% grass-fed beef, organic chicken, and heritage breed pork directly to your door. Most people set up monthly deliveries but you can also do every other month or every three months. Each box comes with about 8.5 lbs of meat, and the price works out to less than $6.50/meal (at a 5 – 8oz portion size). Right now they are offering 2 Free Filet Mignons (2x6oz) + Free Bacon + $10 off for new customers! Click here to check it out! Oven Baked BBQ Chicken, baby! 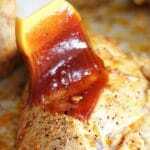 Today we're talking about baking chicken breasts to moist, juicy perfection, smothering them with BBQ Sauce and consuming immediately! Are you ready for this deliciousness? I like garlic but felt it was too strong in this recipe and I actually used more chicken with the same amount of marinade. Also, 5 minutes between sauce at 350 degrees is not enough time for that sauce to even heat up. I didn’t get a BBQ vibe from this recipe. I am making this recipe today for the first time. I am using thigh/leg quarters, how should I adjust my cooking time?